Michael Jackson died on June 25th 2009 at the age of 50. Within minutes of his death, prices for Michael Jackson's Moonwalker increased almost 600%. The prices stayed high for the next couple of days but have since started coming back down. On the morning of June 25th there was an ebay sale of $14.99 for Moonwalker. Michael Jackson's death became public knowledge around 2:20 PM PST. Within an hour and 30 minutes all the low priced store listings for Moonwalker had sold for less than $30. By 3:56 PM, less than 2 hours after the initial announcement, Moonwalker sold for $100 on ebay. At the end of the day the highest price for the game was $199.99. Before MJ's death, the prices for Moonwalker were consistently in the $20-30 range. The average sale price peaked on June 26th at $131. It has steadily dropped back down to the $60 range, which is still more than double the average price before Michael's passing. 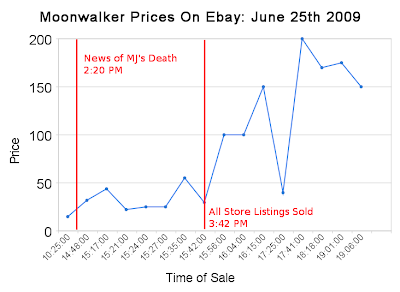 During the 4 days before Jackson's death (June 21st to June 24th), there were five sales of Moonwalker on Ebay. On the 25th there were 16 sales and during the next four days (June 26th to June 29th) 101 copies of Moonwalker sold. Will Moonwalker prices go back to their pre-death prices or will they settle at a new, higher price because of all the attention paid to collectibles related to the King of Pop? Only time will tell. Thanks to our loyal reader James T. for suggesting this article. Damn. I used to have so many copies of this and I pawned them all off for almost nothing. Interesting thought: are there any other non-sports celebrity endorsed games similar to this? Aerosmith's Revolution X, the 50 Cent games, and Kiss' Psycho Circus are the only ones I could think of. Dang. I was going to get that game sometime, back when the price was resonable (ie before MJ's death) but now it looks like I can kiss that goodbye unless I find it at a thrift store. Motley Crue also has a pinball game. ...Can't wait for Vince Neil to croak. Christopher - On ebay we actually monitor every sale, not just every day so we have a lot more price points. I had to manually add some more though because so many sales were listed and sold within 24 hours. We can't always catch those ones. thesimplicity - I was trying to think of other celebrity endorsed games too. Revolution X was all I came up with so you had a good list. I don't know if any of those would have the same drastic increase with the celebrity's death but I'm sure there would be some increase. I should appologise as it's pretty clearly got this place as a basis for layout. Unfortunately I'm not too imaginative that way so without at least a reference I spend weeks figuring out where to put everything, or what to fill in where. But I should get round to changing most of it eventually, just wanted to get something up finally after working on it for so long. This price should be falling back to earth within a few months. These buyers are people who didn't care about Michael Jackson a week ago, after all. I can't imagine them continuing to care about him next year when this frenzy is over. 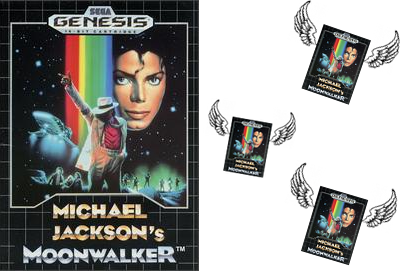 As a side note, Moonwalker is a pretty interesting game in terms of its weirdness. I'll admit, I didn't bother looking up the game... I found out there was a movie version of Moonwalker... that's what I wanted to see (lets just wait for the prices to come down, and/or we see a legal release of it on DVD/Blu-ray).